LogMeIn has recently raised their prices again for their LogMeIn Pro product. Individuals will now have to pay $349.99/year (up from $249.99 in 2017) for LogMeIn’s remote access product, an increase of 40 percent. Splashtop Business Access, Splashtop’s award-winning remote access software solution, will keep its starting price at $60/year, making it 5 years in a row where Splashtop has refused to increase the prices on its popular remote access software. 2018 marks yet another price increase for LogMeIn Pro. 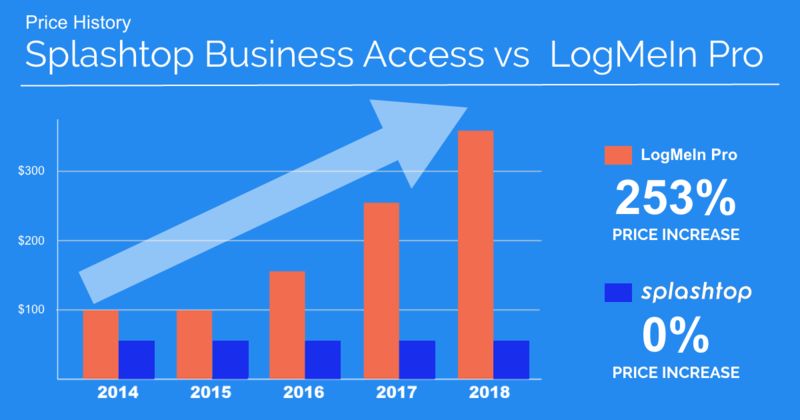 Here’s a look at the pricing comparison of LogMeIn Pro vs. Splashtop Business Access over the last 5 years. Splashtop Business Access allows you to remotely connect to your work computers with any other device. Once connected, you’ll be able to take control of your computer and have access to all of your applications and files. Work becomes easy thanks to Splashtop’s fast connections with high-definition video and sound. With Splashtop Business Access, you can spend less, enjoy faster connections, and access up to 10 computers (compared to only 2 with LogMeIn Pro) with Business Access Pro. Splashtop Business Access offers all the features you need at a much lower price. Interested in trying a remote access solution for the first time or switching from LogMeIn Pro? Give it a try with our risk free, no-obligations, free trial now. It only takes a couple minutes to get started! Your work productivity, and your wallet, will thank you for it later.